Mathematical notation took many centuries to develop. By the mid-seventeenth century, the main operators that we know today were established, +, –, =, but the multiplication sign × had only been used since 1631, and the proportion sign :: is of similar vintage. 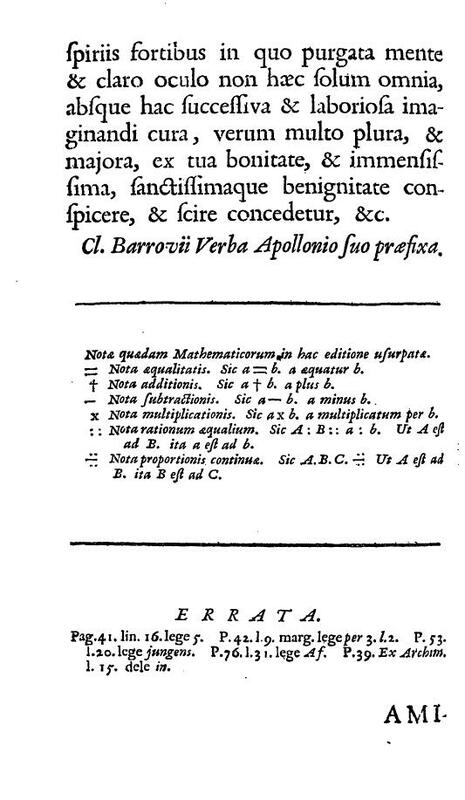 So the list of symbols in this 1703 edition of Archimedes’ Elements of geometry may have been technically redundant, but would still have acted as a useful reminder. ¶ If you’re wondering why the division sign ÷ isn’t included, it wasn’t introduced into England until 1688. Tacquet, Andrea. Elementa geometriæ planæ ac solidæ, & selecta ex Archimede theoremata. Cantabrigiæ: Typis academicis. Impensis Corn. Crownfield, MDCCIII . Oughtred, William. [Clavis mathematicae] Arithmeticae in numeris … Londini: Apud Thomam Harperum, M.DC.XXXI . Johann Heinrich Rahn, trs. John Pell. An introduction to algebra. London: printed for Moses Pitt. 1688.